Better audio for less cash. Good. If you're in the market for an upgrade to your gaming audio and fancy a new headset then there are some good deals to consider over at Amazon UK. 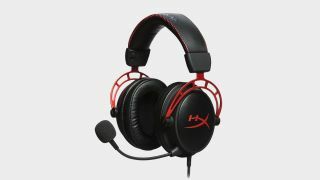 The pick of the bunch is the HyperX Cloud Alpha headset that has 22 percent off. This set of cans is in the top three of our best gaming headsets list and when it comes down by this much, it really is one of the best ear treats you can buy. It's a model in build quality, sound excellence and comfort and will serve up some of the best surround sound, and game audio with fantastic lower-end hits, thanks to a broad frequency response range. Elsewhere on Amazon, there's a bunch of Logitech headsets on offer—some with some big discounts: the G633 has been cut by 45 pounds and its wireless brother, the G933 has been reduced by £65, for example. Toward the other end of the scale you can make some decent savings too by picking up the G430 for half price and the G433 for oh-so-nearly half price. These are all great and reliable headsets from a recognised and respected manufacturer that'll serve you well and keep you immersed for many, many hours. The Logitech G Pro is also on offer but modestly, with a useful, but not giant, fiver off—this also remains on our top list and breaks into the five for PC gaming performance.